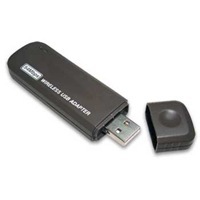 The USB Wireless Adapter provides users a way to connect a PC or Notebook to a Wireless Network It provides an auto-sensing capability which allows high packet transfer up to speeds of 54 Mbps it is compatible with all 11 Mbps wireless (802.11b) products. Wireless communications are protected by 64/128-bit WEP or WPA encryption, for secure data communication. Newlink NLWL-USB01-A is based on the Realtek 8187L chipset, so you can download RTL8187L windows driver for it.